A discussion thread on NationalField between a campaign organizer and Jeremy Bird, the National Field Director on Obama '12. It was back during that 2008 race that a handful of Obama for America staffers working out of a Georgia campaign office began building a suite of online tools geared towards making field organizing more trackable, measurable, immediate, and immersive. It became known as NationalField, a software platform now turned social data company. From one angle, what they created was was simple stuff. Paid field staff and volunteers logged in to their NationalField setup, and through a barebones interface they log what they've been up to. There were fields for hard metrics. How many doors did you knock? How many one-on-one sessions with potential new organizers did you get done today. But there was also a softer component. NationalField users were asked to punch in notes on what went well today, what went badly, and what they could do to do better tomorrow. "It's the qualitative side of field organizing," says co-founder Aharon Wasserman. "It's the kind of information that typically gets kinda lost in a campaign." Together, the hard metrics and softer ephemera alike got poured into a dashboard that gave campaign organizers a quick way to take the pulse of a campaign, and to dive in deeper if they need to. "Someone like Jeremy Bird," says Wasserman, the twenty-something co-founder, talking about a field veteran from the 2008 Obama campaign and now National Field Director for the re-election bid, "can wake up to his Blackberry buzzing with it showing how well everything is going in every state. He can use it to connect people, to say, 'Okay, Michigan, go talk to California.'" In the two-plus years since Obama's presidential victory, the field tracking tool that started within his campaign has been rolled out in scores of Democratic races, in the field work of political advocacy groups, and even in a national health project in the U.K. In progressive organizing circles, its reputation is growing. And there's a chance that it could provide a significant advantage in Obama's re-election bid that most of the public never even knows is there. Organizing for America's group homepage for their Ohio organizing efforts, with more than 1,300 members. The screenshot shows how Ups -- tagged green, Downs -- tagged red, and Solutions -- tagged blue, get displayed in the site's feed. Built into the platform, though, are multiple ways to access and understand the data collected from field organizers over the course of a campaign, from line graphs to tables to data exporting tools. Aharon Wasserman; image credit: NationalField. The twenty-something Wasserman and I are sitting in a bookstore-slash-cafe in New York City's Soho neighborhood, and he's recalling the painful moment from 2008 when NationalField was born. Wasserman left Rutgers to join the Obama campaign as a volunteer, later finding himself Deputy Field Director in Georgia, where he was hard at work registering new voters. One night, during a report-in call with then field director Jon Carson, he struggled to make sense of all the information that his team had brough back from their work out in the field. "I vowed that it would never happen again," he says. He stopped to think about what had gone through in this process. "I realized that I was spending five hours everyday doing spreadsheets, but in the end I had no idea what had actually happened because all I had been doing was cutting and pasting." Sparklines are tiny in-line charts pioneered by information design icon Edward Tufte, and which are included in NaitonalField's social feeds. With another campaign aide, Justin Lewis, he retreated to the white board. They had a little programming knowledge between them, "and within two weeks, we had a private beta." Powered by PHP and MySQL, the results, GAObama.com, indeed gave field managers like Wasserman a snapshot of what was happening out in the field, what he'd been missing on that call with Carson. But some added-in features designed to help make sense of all the data ended up encouraging field staffers to meet their goals. In many campaigns, filing reports from the field can be like dumping them into a black box. Here, workers could see where they stood, and what they had to contribute so that, collectively, the organization's efforts could add up to electing Barack Obama president of the United States. "We had people running out the door to find three more people to register to vote," says Wasserman, quietly laughing,"so that they could get on top of that leaderboard." A NationalField chart showing aggregate weekly data.. The software's roots in the Obama campaign are apparent, its design a reflection of the much-commented-upon and often-admired team-building model of the Obama campaign. Often associated with academic and organizer Marshall Ganz, the team model of community organizing seeks to amplify a movement's reach and voice by giving workers at every level of the organization responsibilities and agency that other campaigns tend to reserve for paid staffers. Wasserman says that, early on, he was a skeptic of the team-within-teams-within-teams model. Shouldn't we be out registering voters instead of recruiting people to recruit people to register voters? But, he says, he got on board. "I realized that we were such an underdog that we really had to invest in building tiers of people." As Obama worked it, the team model requires a great deal of attention to diligent tracking of what this wide network of humans is doing on behalf of the greater effort. NationalField provides a software infrastructure to that Ganzian community organizing approach. Think of it this way. On Facebook, we're all equal. On NationalField, we're all in this together, sure. But only some of us are responsible for turning in numbers when the big boss calls and wants a report. "You can configure it so that a field director, for example," says Wasserman, "can see everything that's happening below him in the organization, and one level up." Wasserman sums it up by calling NationalField the world's first heirarchical social network.Or more simply, as they ended up branding it after the 2008 race, "the private social network that helped elected a president." 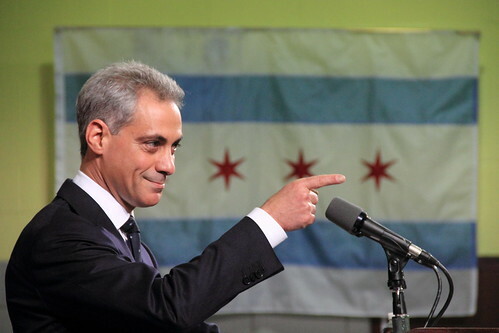 Rahm Emanuel's Chicago mayoral campaign used NationalField. Other users have included the Democrats' 2010 Nevada coordinated campaign and the anti-poverty organization ONE; photo credit: Daniel X. O'Neil.. In the wake of Obama's victory, people were intrigued, says Wasserman. "The DNC called and said, 'What are you doing with NationalField?" Turning the platform into a company, the founders ended up working with the Democratic Congressional Campaign Committee to support a number of races -- the software's agility with distributed networks holds particular appeal for a party organization trying to keep tabs on races from California to New Jersey. New York's Working Families Party became a client. The years 2009 and 2010 became a chance to test drive NationalField in organizations that weren't the Obama campaign it had been built for, with each organization getting a customized version of the platform. Corey Warfield, a field director last year's coordinated Democratic campaigns in Nevada, says he appreciated NationalField's long-view; the Google Docs and Excel spreedsheets of other campaigns tend to get scrubbed once the numbers are bubbled up to the next level of the campaign. (Organizations, for the record, keep the data inputted on their behalf. Wasserman says their working to make it easier for invidual users to maintain continuity between the data they've contributed across campaigns and other NationalField instances.) Anna Valencia was the field director for former Obama White House chief of staff Rahm Emanuel's recent successful run for Chicago mayor. "Chicago is a big city," says Valencia. "And it was a great tool to tie our offices together." More than that, she appreciated the real-time nature of its reporting. "Sometimes in a campaign you have all these layers to get through," she says, "but here information shoots up the ladder very quickly." As the use of NationalField grew, so did NationalField the company. The organization now has offices in Washington DC, just north of Dupont Circle, and in London. They're opening up another office in San Francisco, says Wasserman. People, he says, seem to like the challenge of working on figuring out how to tackle the challenges of using social data to organize people. Door knock counts and buffalo wing consumption numbers (see left) might be obvious metrics to track. But figuring out what data to keep tabs on in other situations can be a real challenge. NationalField sees a growth opportunity in all that confusion. "Organizations like the idea of metrics," says Wasserman, "but they really don't know what they should be tracking. We're taking what we learned from the Obama campaign and helping people learn to track based on relationships. There's interest in data tools for field organizing outside of campaigns to get someone elected. Obama's 2008 success has arguably upped the appeal of running your organization through distributed, bottom-up-and-top-down teams, while aggressively tracking the results. The company points to a growing project in the United Kingdom where the National Health Service is using NationalField to connect patients once they've left the doctor's office. The Sierra Club is another client. During the heated 2008 battle, Mike Henry was on the other side of things from the NationalField folks, as Deputy Campaign Manager for the Clinton campaign. But now he directs U.S. campaigns for the anti-poverty group ONE, and he counts himself a fan and pleased user of what his old adversaries have built. "What's unique about it," he says, "is that it gives you a qualitative picture everyday that has texture to it." "There's nothing uniquely political about what we're doing," says Wasserman. "It's just about capturing data and feeding it back to people." Sometimes it's about capturing data about people feeding; for sport and education, members of the NationalField team held a SuperBowl XVL party that featured the tracking of buffalo wing consumption using RFID tags -- on the eaters, not the wings. NationalField is taking what they've learned over the last few years and using it to make their software smarter -- which often means making it more social. It's not surprising, in that central to the the team model is the personal story, as in the unique narrative told by organizers about why they're bothering to get out of bed and knock doors for the candidate or cause. In January, NationalField rolled out what even they admit looks a lot like Facebook's news feed, an integration that pulls together the various threads happening in an organizing group and then gives users the ability to engage with that information. There's even a "Like" option under posts. Users like Bird have figured out how to extend the social nature of the tool. He regularly tweets out notes of encouragement to organizers all over the country based on what appears in NationalField . "@John_DeSantis held 14 1:1s at a Rochester coffee shop today w @OFA_NY volunteers #baller," Bird recently tweeted. DeSantis, a regional field director for Organizing for America in Central New York, retweeted Bird's note. There's talk of baking Twitter handles into National Field to make the whole process even more fluid. And a mobile interface is in the works. Part of that upgrade to the software's social grace is figuring out how to present data-rich updates in ways that humans can quickly make sense of. "We're getting smarter about the logic behind what shows up in graphs and what shows up in language," says Wasserman, though he admits, "it's been a struggle." They recently introduced into the feed sparklines, those tiny in-line graphs that are the creation of Edward Tufte, the information designers who happens to be helping the Obama administration figure out how to make the federal open data hub Recovery.gov more intelligible to humans. Neat software, perhaps. But does NationalField actually represent any sort of unique electoral advantage for Democrats? Republicans point out that there have always been ways for field data to be aggregated back at headquarters, whether by phone, paper, database, or email. One Republican with presidential experience says that there are software tools on the right with the same basic feature set, though the staffer cautions about not having had a chance to play with NationalField. That's not an accident. I ask Wasserman if there's a political litmus test for NationalField clients. It hasn't come up, he says, but "we are where we are because of President Obama." Other grumbling you hear has to do with the idea that, no matter the fun and social vibe of NationalField, if you're the hard-working field staffer, you might not be all that eager to have management several rungs up the ladder being able to have one-click access to the granular details on how you're spending your days. There's the worry that by making field organizing tools look a lot like Facebook, you risk trivializing the heavy-lifting of campaigns, especially among younger native Facebook users. One advocate who used NationalField in the past said price can be an issue; Wasserman reports that teams of ten members or fewer can use the platform's basic tools for free and that teams of up to 25 can start using the platform for $99 a month, though costs go up for larger groups and deployments of greater complexity. And some folks simply aren't ready to embrace the data-driven life. "Some people just don't want to be held accountable and actually track their metrics," says Wasserman. But the Obama campaign was ready in 2008 to track the metrics of winning a presidential election. They look even more ready this time around. I ask Wasserman whether Obama for America has officially signed on the dotted line for the 2012 race. He deflects by saying that "since we started building out NationalField in 2009, we've been building it for the re-election." There's room to grow once 2012 heats up. Wasserman talks about the possibility of integrating NationalField into My.BarackObama.com, the campaign's public social network, which would bring its potential to a much wider audience than it has yet to see. "We were able to pilot this in 2008, but we've also been working on it now for more than two years," says Wasserman. "The chance to deploy this out to the whole campaign this time around is what's really exciting."